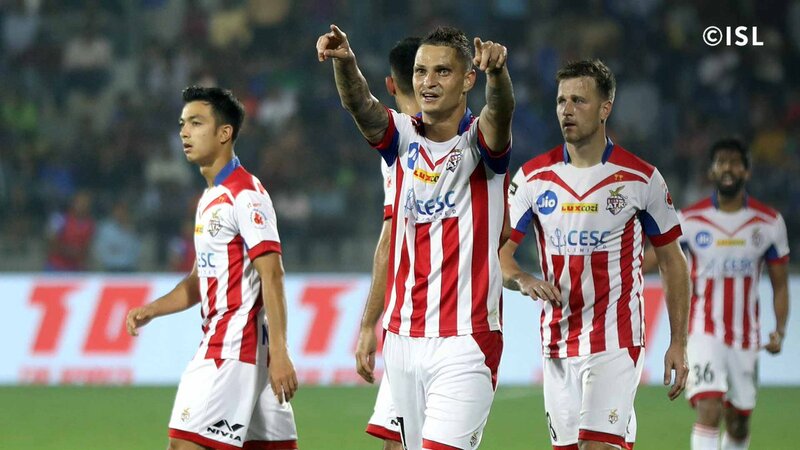 Mumbai, Dec 17: Defending champions ATK tasted their first win in the Indian Super League (ISL) football tournament, defeating hosts Mumbai City FC 1-0 at the Mumbai Football Arena here on Sunday. Midfielder Jose Egas Dos Santos Branco, also known as Zequinha, scored the sole goal in the 54th minute. With this win, ATK, which came into the match as the bottom-placed team, has now climbed up one spot to seventh in the points table with five points in five matches, surpassing Delhi Dynamos. Coming into the match after two draws and as many losses, ATK started play sensibly and kept the ball possession. The visiting side got two free-kicks in a span of five minutes. They also got an early chance to score on the second free-kick but failed to convert it. Mumbai, on the other hand, struggled to find their feet in the initial minutes but as the game progressed Mumbai created a few chances via striker Balwant Singh. Playing with the same strategy, ATK got another chance to take the vital lead through defender Thomas Joseph Thorpe, when a perfect volley landed on him in front of the goalpost, but goalkeeper Amrinder Singh defused the effort. The defending champions then sharpened their attacks through some great team work but a lack of luck and some brilliant goalkeeping by Amrinder denied the opening goal. In the 38th minute, Zequinha made a perfect solo run from the mid-line and it seemed that the opening goal of the match was about to happen but again the goalkeeper stood firm and made a brilliant save as both teams went to half-time goalless. The second half started with both teams testing each other's defence. Firstly it was Mumbai's Balwant, and then ATK's Zequinha and midfielder Ryan Anthony Taylor. Former Tottenham Hotspur star and Irish great Robbie Keane, who is playing his first match of the season, also showed a burst of pace to get a shot on target, but Amrinder parried it away. But the much-awaited moment came when ATK's Keane passed the ball to Zequinha in the box and the Portuguese fired it from the right wing to make it 1-0. After conceding the goal, Mumbai's defence seemed lost in the field and ATK's strikers made full use of it by penetrating into the box several times. In the dying minutes of the match, ATK's goalkeeper Debjit Majumder made some heroic saves from almost point-blank range and denied the hosts the equaliser.